One of the benefits of being a corporate entertainer is that many of the venues I perform at are top notch. 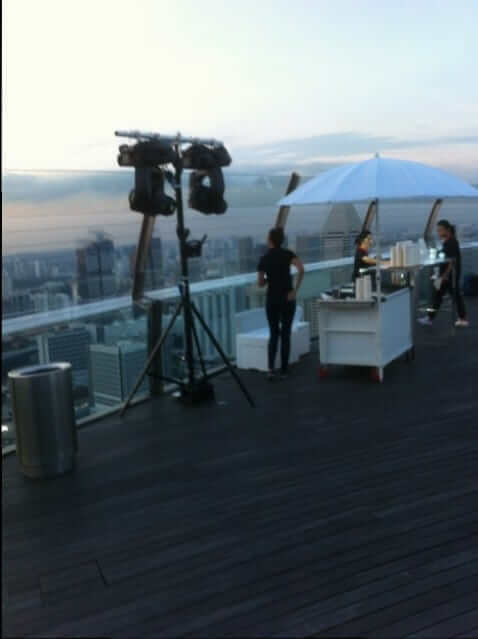 In Singapore we have a lot of high rise buildings and many of them have roof top bars one of latest ones is the bar Ku De Ta on top of the Marina Bay Sands Casino. 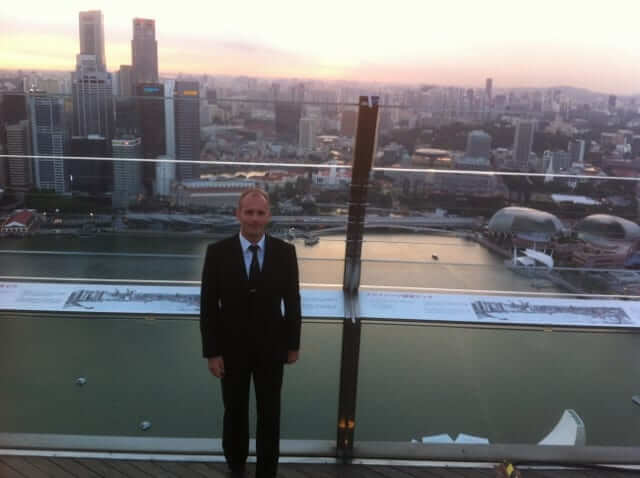 Deutsche Bank was looking for a corporate entertainer in Singapore for the annual networking event that is hosted at the Sky Bar of KuDeTa at the 57th floor for MBS. I was hired to do roving, street magic for 2 hours at this event. If you visit Singapore and you want to enjoy the view from MBS I would recommend to go to the bar and have a drink. This way you don’t have to pay the fee. If you go to Observation deck at the Sky Park they charge you SGD 23. The view at the bar is great as well and you get a drink for the money. The event was fun but at the end I was soaked. Singapore in May is very humid and wearing suit and tie adds to this even at the 57th floor. 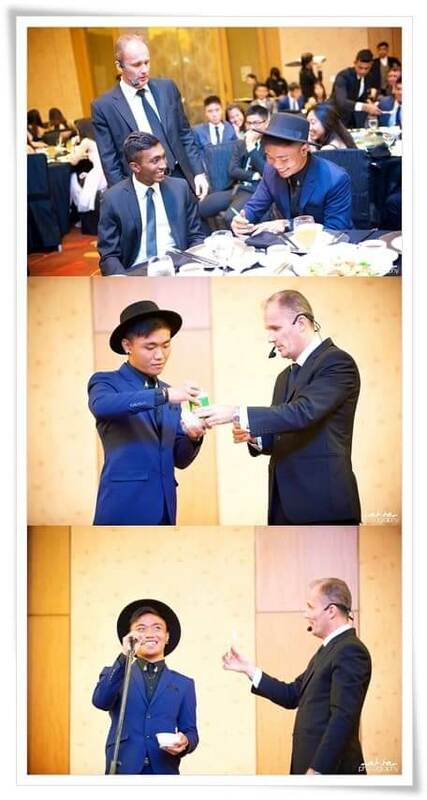 When you work as a corporate Magician Singapore you are sometimes booked for events that are not a regular performance like at party or corporate dinner. I am currently hired by MasterCard to support their launch of a new program called Priceless Surprises. Basically I have to come out twice an hour and perform a quick bit for the current winner. I sometime think this is not ideal for Magic since you are used as gadget. However I believe it is your job to your best to perform a good show for the client regardless of the setting. During one of the performances I had 2 ladies on the platform with me and their faces were the perfect match for the tagline of the campaign a priceless surprise. I hope that the on site photographer got a snapshot of that. Basically it is important to have fun with any given situation this positive attitude transcends to the people watching and they ‘usually’ like what you do. 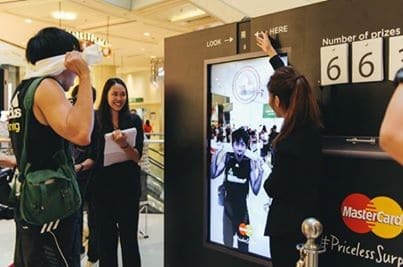 I will do 4 more of these at Sentosa and at the MasterCard Theater at Marina Bay Sands. My friend Picasso hired me to perform at a Deloitte corporate event at the Ritz Carlton. I did 2 hours of strolling magic and shared the gig with Adam Chua a great caricaturist . You can check out his website here . We have worked together at multiple events before but I always forget to ask him to draw a caricature of me. Well maybe next time. The group consisted of mainly Deloitte tax consultants from all over the world. Not surprisingly I found a bunch of Germans there. Well Germany has one of the most complicated Tax Laws worldwide and to do your taxes you definitely need a consultant. I prefer Singapore – I can do it on my own.